The symbol is a unified image of the whole universe. The overall structure signifies the ultimate power, the divine energy, the unity of all things etc. 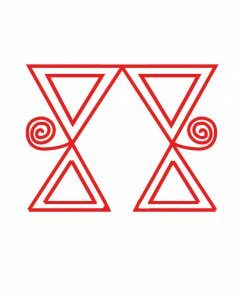 The symbol can be divided into two parts equally both of which are symmetrical and identical. The division of the symbol represents the unity of two opposites and that life’s completion lies in the meeting of two opposites. The two opposites represent individually the energy of Male – Female, Shiv – Shakti, Positive Energy – Negative Energy, Yin – Yang, Hot – Cold, Sun – Moon, Waxing of Moon – Waning of Moon, Day – Night, Warm light of Sun and Cool light of moon. The meeting of opposites has a very deep message within it that life’s perfection, life’s completion shall always happen because of the balance of the two opposites and both opposites are equally important. 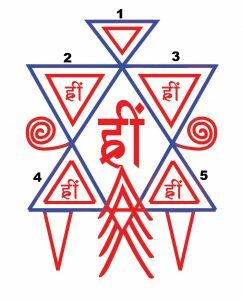 The three gunas – Satvik (goodness), Rajsik (passion) and Tamsic (darkness). The three temperaments of Ayurveda – Vata, Pitta and Kapha. The three lokas – Dharti, Aakash and Pataal. The four Vedas itself : Rigveda, Yajurveda, Samaveda, Atharvaveda. The four phases of life as defined by the Vedas – Brahmacharya, Grahastha, Vanaprastha, Sanyasa. The four phases of life – Childhood, Youth, Middle Age, Old Age. The five moral evils or attachments of life : Kama (Passions) , Krodha (Anger) , Lobha (Greed) , Moha (Attachments) and Ahankaar (Ego). 6. 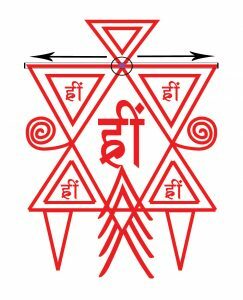 The symbol represents the form of a Damru. Damru is an element used by Lord Shiva, the destroyer of negative energies. 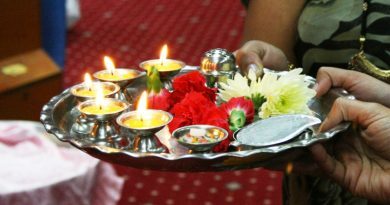 Whenever the damru is played out, it destroys the negative energies at all levels. The release of negative and the development of positive energy leads to the overall protection of the individual. Thus usage of this symbol ultimately leads to the protection of an individual at all levels. 7. 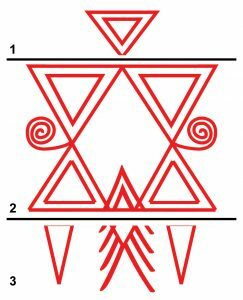 There are seven triangles in the diagram as identified. These triangles reflect the seven colours of life ( VIBGYOR – Violet, Indigo, Blue, Green, Yellow, Orange, Red), Seven pieces of music, Seven layers of body, seven horses on Lord Sun’s chariots. Represents the kundalini energy which moves in such a way that it creates the number eight. Eight is also the form in which the DNA and RNA are made. It has nine triangles as shown in the diagram. 10. The way the diagram is made is also representative of the way these energies shall be transformed and transferred to the final receivers. 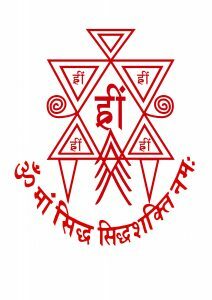 The first line on the top of the symbol represents the infinite sidhshaktis, universal energies that exist in this universe. 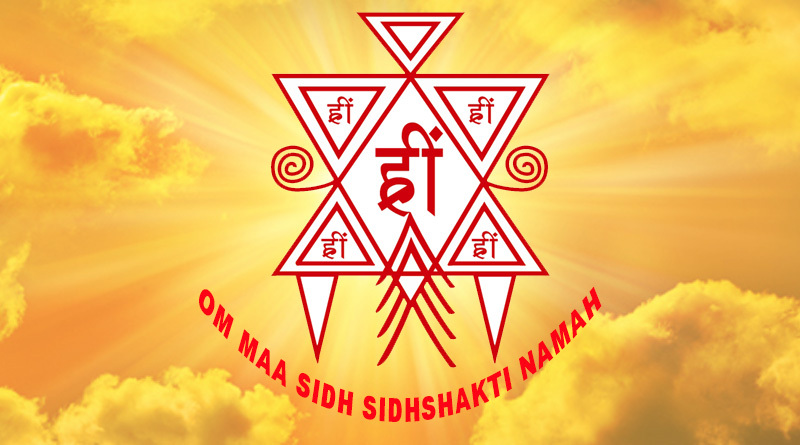 These energies are being gathered together, collected and made Sidh by Sri Maa. This is signified by the convergence of the line into one point and thus creating a triangle. 2. 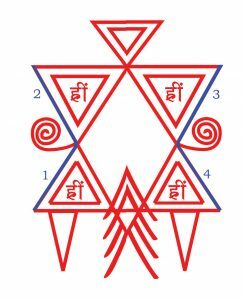 The second level is where these energies are getting distributed into the physical world, this distribution is signified by the second line that connects with the triangle. 3. 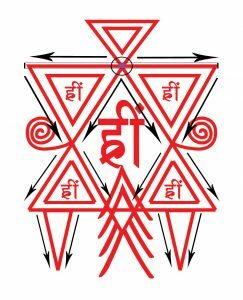 The two triangles below this line are significant of these energies converging into Sri Maa’s devotees who once gain, distribute the energy into the general public and the public receiving of this energy is represented by the downward pointing triangles towards the end of the symbol. It gives protection to the vehicle on which it is placed. Increases efficiency of the machines and vehicle when placed on the fuel tank. 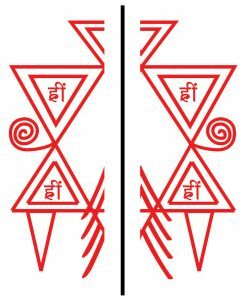 It protects from all kinds of negative energies and even black magic by placing it on the doors and windows of the house, office, factory, shop, schools, etc. Receive divine blessings by keeping it in the place of worship of home, office, factory, shop etc. Positive divine energies flow in all directions, wherever it is placed. Wherever it is placed, that area around it get’s filled with positive energy and a very strong protection shield starts developing around that area. It also removes the negative energy of eatables, gifts etc. brought from outside. Keeping it under the pillow at night, removes sleep disorder, tension, negative thoughts, weakness, and tiredness and makes the person fresh and strong for the work next morning. Helps in removing emotional and mental vices and negative thoughts. 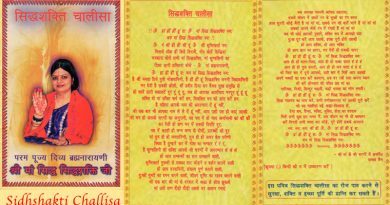 Helps in curing diseases by using it with other spiritual articles and meditations. Removes pain, and increases life-force energy of the organ where it is placed. 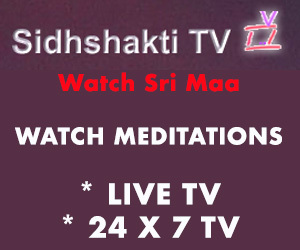 While doing Wealth Enhancement meditation if you also keep Sidhshakti Symbol in the place of wealth, in your wallet, purse or safe, it increases wealth and helps in reducing expenditure. When students keep it in their books, they recollect the content studied easily and quickly. By keeping it in the pocket it gives protection, increases positive thoughts, and gives ability to take correct decisions. Relief in pain by placing on the area of pain. Note: The experiences and benefits varies from person to person and also depends on the devotion with which you use it.